Most people in jail have not been convicted of a crime. Instead, they have been accused of a crime and cannot afford to post the bail amount to guarantee their freedom until trial. Punishing Poverty examines how the current system of pretrial release detains hundreds of thousands of defendants awaiting trial. Tracing the historical antecedents of the U.S. bail system, with particular attention to the failures of bail reform efforts in the mid to late twentieth century, the authors describe the painful social and economic impact of contemporary bail decisions. As the first book-length treatment on how bail reproduces racial and economic inequality throughout the criminal justice system, the book explores reform efforts as jurisdictions begin to move away from money bail systems and the attempts of the bail bond industry to combat reform. 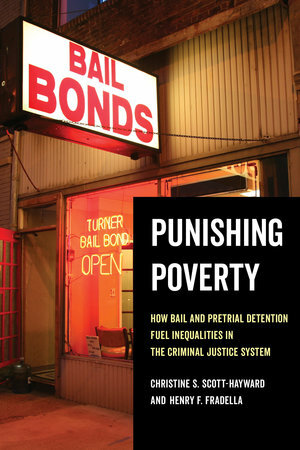 Accessibly written, Punishing Poverty gives a succinct overview of the role of pretrial detention in fueling mass incarceration and is essential reading for researchers and reformers alike. Christine S. Scott-Hayward is Assistant Professor of Law, Criminology, and Criminal Justice at California State University, Long Beach. Henry F. Fradella is Professor of Criminology and Criminal Justice at Arizona State University. Fradella is the author or coauthor of a dozen books, including Stop and Frisk and America’s Courts and the Criminal Justice System.